Hello, I’m Josh Duncan with SCBTV News bringing you this edition of Financial Freedom. The purpose of Financial Freedom is to provide tips to help you achieve financial freedom for personal significance. Last time we discussed how to create a spending plan. When reflecting on that discussion, it seemed necessary to provide some guidelines for different types of spending. These are simply guidelines to help you either get started or evaluate your current situation. Let’s begin with the mortgage payment. I prefer to use Dave Ramsey’s rule of thumb for this category. He says your mortgage payment, including insurance, taxes and HOA fees, should be limited to 25% or less of your monthly take-home pay on a 15-year fixed-rate loan. For those of you who are considering purchasing a home, I encourage you spend some time understanding this principle. Also, try to put 20% down on your home to avoid private mortgage insurance. Now that we have discussed mortgages, let’s look at the other costs of home ownership. The major categories are home maintenance and bills and utilities. Home maintenance can be thought in two categories of smaller items and larger items. Small repairs you can do yourself won’t cost much. There will be more expensive items that will require more time or the need to hire help. About 10% of your take-home pay could be used for home maintenance. Bills and utilities will vary throughout the year as the seasons change. You will have to be flexible on this spending category. However, about 10% of your take-home pay is a good place to start. Groceries and household items could take about 10% of your take-home pay. A few ways to keep this spending category in check is to use shopping lists and avoid grocery shopping when you’re hungry. The auto and transport category may take around 5% of your take-home pay. This will vary depending on the distance you drive for work and extracurricular activities. Next up is the health spending category. Since I am focusing on take-home pay, I’ll assume your health insurance premiums are paid through your employer and deducted before your net pay. 10% of your take-home pay may cover your typical medical expenses for doctor visits and medication. This will vary depending on your situation. Although we are talking about your spending plan, I can’t help but mention retirement savings. If you have a retirement plan through your employer, your contributions will be made before your net pay. For those who don’t have a plan through their employer, you will have to figure this savings into your spending plan. The rule of thumb here is to save 15% of your gross pay for retirement. This does not count your employer match, if you have one. Charitable giving is the next category to plan for. One study reported 2/3 of Americans make charitable contributions. A good place to start is 10 of your gross pay. This is a great way for you and your family to give back. Finally, is the additional savings and miscellaneous category. My actual monthly spending doesn’t match these guidelines every month. Nobody’s does. Therefore, you must build flexibility into your plan. You may be saving for a vacation or working to get out of debt. Regardless, building margin into your budget will give you breathing room when reality changes things up. This could be anywhere from 10% to 20% of your take-home pay. Start small but have a plan for some margin. Remember these are guidelines to help you get started or evaluate your current situation. We all have different situations. Modify these guidelines for you and your family. Thank you for joining me for Financial Freedom. 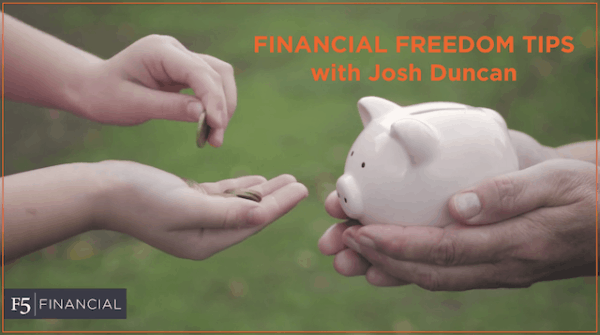 I'm Josh Duncan with F5 Financial Planning, helping you achieve financial freedom for personal significance. Please contact me here to send topics you would like me to cover. See you next time.